Th-this is rather unladylike of you, isn’t it? Vampire: Wait…this isn’t monofilament! It’s piano wire! 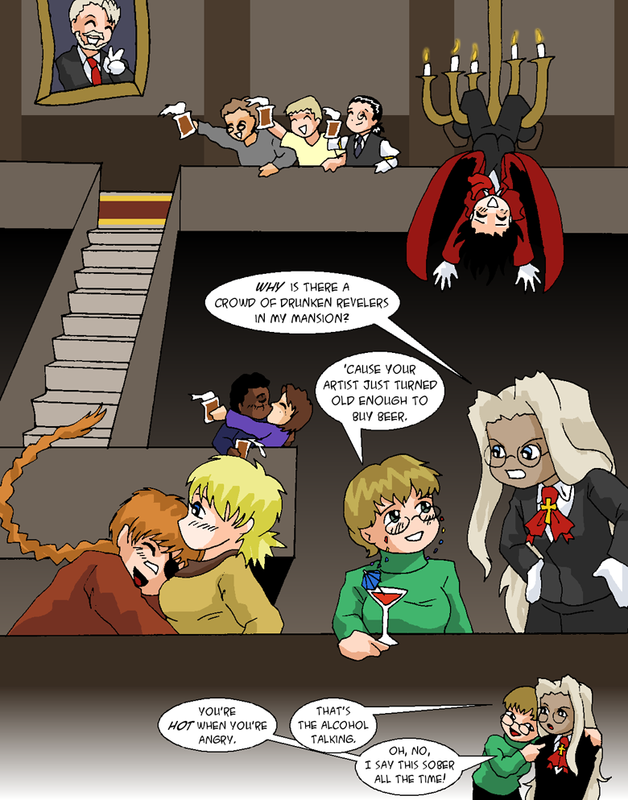 Integra: Why is there a crowd of drunken revelers in my mansion? Erin: ‘Cause your artist just turned old enough to buy beer. You’re hot when you’re angry. Integra: That’s the alcohol talking. Erin: Oh, no, I say this sober all the time! Vampire: How do you know Jeeves? Bertie: Uh, he’s my valet. My gentleman’s personal gentleman, you know. Vampire: Then I’ll make him show himself. Narration: Between Arthur and Walter, I managed to make it through the day. But I had the most awful time of it, I tell you! By evening, I was waiting on the doorstep. Walter: You okay, Mr. Wooster? Bertie: Jeeves went on an errand this morning, and hasn’t been back. I’m a bit worried. Walter: Don’t be stupid! There’s nothin’ Jeeves can’t handle. Bertie: Nothing in the field of valeting, at least. But he’s only human! Arthur: Okay, I have a confession to make. I sent your man Jeeves off on a little personal errand of mine. Bertie: Oh! Well, I suppose that’s all right. Arthur: Anything I can do for you while he’s away? …for this job he’s a little, well, little.